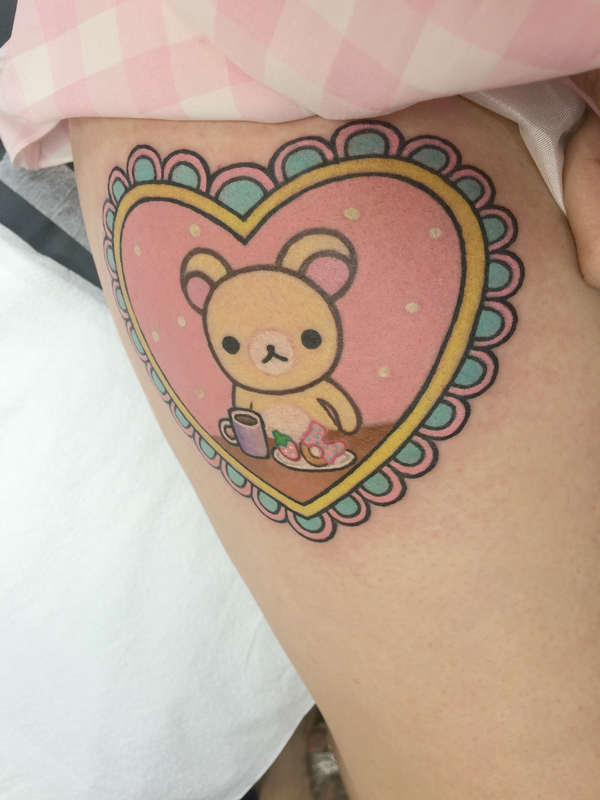 I've been wanting to get a Korilakuma tattoo for so long now and I finally got it done! I got it done by the lovely Melvin at Propaganda Tattoo. It was my first time getting any kind of ink done on my legs! This is currently my 6th tattoo! It came out even better than I expected. Im so completely in love with it! I just got it today (Jan 17th) so its still pretty swollen and puffy but once it heals ill post an update photo! I actually found Melvin on instagram after looking everywhere for a tattoo artist that does cutesy tattoos. She actually did my other tattoo that you can see here. The details are so amazing! The sprinkles on the doughnuts and the little seeds on the strawberries are my favorite ♡ u ♡ Honestly it did hurt pretty bad and compared to my other tattoos its one of the worst ones but it was so worth it. It took around 4 and half hours in total so by the end of it my skin was really sensitive. I would do it all over again though if I had to because its so amazing. I really hope you guys like it and if you want to get anything done by Melvin I would suggest calling her at propaganda or message her on instagram! ♡ If you have any questions about tattoos or anything leave them below and ill do my best to answer them!